Lucky Cow | CowParade Retired Figurines | One Price Low Flat Shipping! From the CowParade Retired Collection, Lucky Cow. Featured at the CowParade London 2002 exhibit. Made of ceramic. 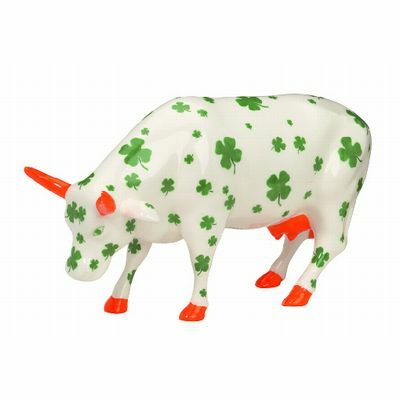 Measures 4" x 6"
This cheerful cow is white and dotted with rich green four leaf clover leaves all over accented by orange painted hoofs and horns. Please note: Cow does not come in its original box.